Welcome to a special edition of this “This week in Gaming.” For this week, we’re going to take a break from our usual Magic: The Gathering discussions and talk about something special to me. This week we’re going to talk about Extra Life 2015. If you remember last year, I wrote a little article about my intentions to join the Extra Life 2014 campaign. If you weren’t around for any of that, then you’ll be happy to know that we ended up raising over $2500. However, that was all done last year. This is a new year. A new year means new goal and a new goal means a new story. I was off to the races the moment I registered for Extra Life 2014. I took to Facebook and posted about my campaign, my goal, and all that jazz. I was so ready, I even had contests ready to go to start raising money. I was like a kid in a candy store. There were all of these opportunities and feelings of excitement that I was getting ahead of myself. Almost every month leading up to the Extra Life 2014 Game Day, I was trying to give something away. This year, things are going to be different. For starters, last year, I tried to run almost a year long campaign. This year, I decided to wait a little longer before I got things started. I only recently sent out Facebook invites to the Game Day. In case you didn’t get one, don’t worry. It’s not a private event that only my friends are allowed to go to. Everyone can come! In fact, I encourage everyone to come. Oh what’s that? You have no idea what Game Day is? First, let me start off by explaining what Extra Life is all about. Extra Life is a charity that was started several years ago by a bunch of gamers. Their purpose was to help make life a little bit easier for kids who are in hospitals for extended stays due to illness, treatment, etc. It started out as gamers donating games to keep the kids entertained. In the following years, with the help of Twitch, gamers took to the internet to stream themselves play video games for 24 hours. Now, thanks to the tabletop boom, Game Day has evolved into a 24 hour gaming marathon of people broadcasting and gathering in real life to play games. Last year, both Battleground Games & Hobbies locations took part in the Extra Life 2014 Game Day. I honestly have to say I was surprised. I was grateful that the Abington store was gracious enough to open it’s doors, but to have both stores was somewhat overwhelming. This year, we plan on doing the same thing – both locations will be hosting a 24 hour gaming marathon. One thing that will be different though will be the starting time. Having been the first year, I thought it would be a good idea to have Game Day fall directly after Friday Night Magic. On paper, the idea made sense. Why go home only to come back and open the store for 24 hours? Just get it all done right then and there! Somewhere in the world, someone is hitting a big red buzzer. I was wrong and many people reminded me throughout the day as kindly as they could. I totally forgot that some people live normal lives and have jobs. Some of those people came straight from work and stayed as long as they could. This year, we’re shooting for a 10 AM start time and a 10 AM end time. This should give people enough time to go home, get some sleep, and gather enough energy to stay awake for the next 24 hours. The change in time is probably the biggest change we’ll be making for the the 2015 Game Day. Something minimal I’d like to see is a corner we can call home base. This is a set up where we can stream live on Twitch. I’d like to either broadcast a board game being played or someone playing a video game. This would allow us to extend our reach and allow those who couldn’t make it in person to be there digitally. Did you know that that Twitch has an app? So if all goes according to plan, if you can’t make it to the event, you’ll be able to at least watch us via the internet. One more piece of important information you’ll need before we part ways. The Extra Life 2015 Game Day will be celebrated on November 7, 2015 and will carry over into November 8, 2015. For more information, you can click on the banner at the top of this page. Simeon is now the Community Manager for Battleground Games & Hobbies. If you have any questions or inquiries, then you can reach him at Sims@battlegroundgames.com. He is also an avid gamer who loves to play board games and video games. He graduated college with a degree in Political Science, and now serves the public by writing about games. You can check that out here. Don’t forget to “like” him on Facebook as well. It’ll update you on all of his newest content. Best of all, you can follow Simeon on Twitter (@SimeonCortezano) for some real time hilarity. Thanks for reading! The Extra Life 2015 campaign is underway. Donate today! Join the Battleground Games & Hobbies community forums! Please don’t forget to check us out on Facebook and follow us on Twitter @battleground_gh! 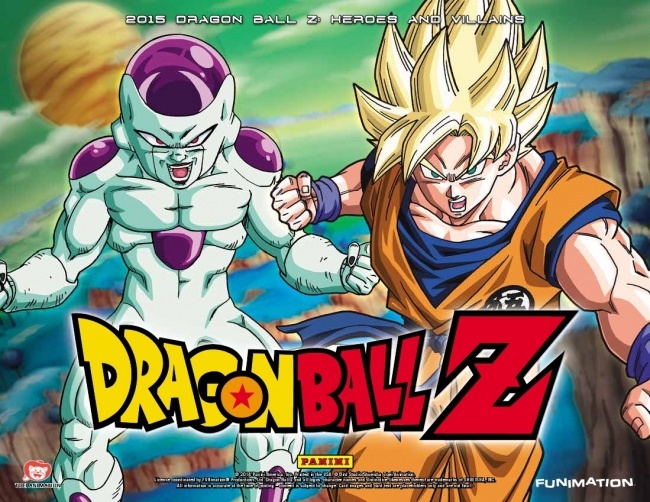 Panini America will release the new Heroes and Villains booster for its recently rebooted Dragon Ball Z Trading Card Game on March 4, according to hobby industry news website ICv2.com. New heroes and villains (Raditz, Nappa, Tenshinhan, Nall) will join the fray, as the release expands on strategies and decks from the first release, while also providing cards that will be used in future deck archetypes. There are new Ally cards, as well as the first personality cards of villains Zarbon and Dodoria as Allies. The booster-only expansion will include 142 new cards, including 24 rare cards (one per pack), 8 unique foil parallels per box, and Ultra Rares included in every other box. Packs include 12 cards, with 24 packs per box and 12 boxes per case. This week’s article is going to start off a little bit reflective. First of all, I can’t believe I’ve been doing this weekly since February. Now if I could only convince myself that running was like writing. Maybe I’d be in better shape. If you’ve stuck with me since the beginning, I want to thank you, and if you’re just getting here, then I hope you enjoy the rest of the ride for however long you stick around for – which I hope is for a while. So, I bet you’re wondering why we’re starting off in such a reflective mood. Well, the reason being is that one of my first few articles was titled, “From couch to cash: Trying to redefine the gamer stereotype.” In this post, I talked about how I had read a comment that, to the effect, made gamers still sound like couch potatoes. In fact, for a while, gamers have been doing quite a bit. This even included participating in numerous charity events including, but not limited to, Child’s Play, Awesome Games Done Quick, and Extra Life. A couple weeks after I wrote that post, I signed up to take part in the Extra Life challenge and began my campaign to raise as much money as I could for the charity. 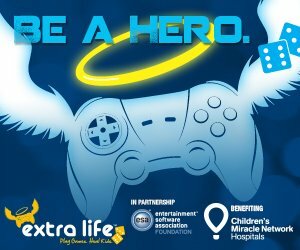 For those of you who don’t know, Extra Life is a charity organization that raises money to help benefit the Children’s Miracle Network Hospitals. The hospital I am raising money for is the Boston Children’s Hospital. As the story goes, Extra Life got it’s first big start in 2008. Then, Extra Life was a way to honor a girl by the name of Victoria Enmon. She was then battling acute lymphoblastic leukemia. A small group of independant gamers known as the Sarcastic Gamer Community got word of her battle and members send in games and other gifts to try to raise and maintain her spirits through numerous visits in and out of the hospital. Unfortunately, Victoria lost her battle with Cancer in January of 2008. Later that year, the Sarcastic Gamer Community decided to put on the first 24-hour gaming marathon to try to raise money for the hospital that treated Victoria. In 2008 and 2009, the group raised a combined $302,000, all of which went to the Texas Children’s Hospital. Since then, thousands of gamers have gotten together every year to help raise money for kids who end up in hospitals for extended stays due to various ailments. The money raised goes towards a variety of purposes to help kids out. Why do I Extra Life? First of all, it goes towards a great cause which is helping kids out. I don’t have to remind you how much fun games are. I also don’t have to remind you how much fun games were when you were a kid. Imagine being stuck in a hospital with nothing to do because you’re too sick to leave. I would go crazy. Thanks to charities like Extra Life, that doesn’t have to be the case. Another reason why I Extra Life is because I am a gamer. I have to admit, part of me is in a little competition with myself. Just like in any other game, I try to hit as many achievements as I can and score as many points as possible. Well, here I’m trying to raise as much money as I can. In every little detail I’m trying to out do myself, and this is my first year! Call me nuts, call me ambitious, but either way I’m having a lot of fun. Plus this gives me a reason to play games with my friends for 24-hours! Does it get any better? Of course all of this work and campaigning is all leading up to the big event. The big event is only a little more than a month away. Admittedly, I’m scared. Scared of what you ask? Well the obvious is failure; failure to launch when the big day comes. I’m not going to lie. When you’ve invited all 600 friends on Facebook and only 15 have said they’re going, it’s a little uncomfortable. However, I take comfort in knowing that 15 have said they are coming and not zero. I also take comfort in knowing that I am half way to the goal I set at the beginning of the campaign. I also take comfort in knowing that I belong to a great local gaming community. So, while I have my fears, I know that I also have reasons to believe. Alright, enough rambling, I’m sure you’re wondering what’s going on at this big event. Well, I’m still working on it. I do have a few ideas in mind. I wonder, though, how much should I let you know? I can tell you this, I would definitely love to have a “Magic: The Gathering” Pauper tournament. Pauper is such a fun and casual format, but the group that plays at the store can be quite competitive. So with that in mind, I might make some special rules. For example, I’m probably going to ban Delver. That’s a pretty good start in my opinion. Another possible, special event might or might not involve Derek Lloyd, a Wizard’s Cape, and an original Dungeons and Dragons adventure. However, if you want in on this action, you’ll need to make a donation to the charity. Oh, and the catch is that seats will be extremely limited. Did I mention it will probably be a one-time thing in the entire 24-hour gaming marathon. There will be plenty of other things to do as well. It’s not just going to be 24-hours of MTG. We’ll have board games, and possibly even some video game consoles. We’d also love a way to stream the event to Twitch. So if you can’t be there in person, you can at least watch all of the action. I’m happily and constantly taking monetary donations. I am, of course, working on ways to “invite” donations, though. I’ve got a few things lined-up to raffle off and giveaway. These are things that I have obtained myself and through my own funds. However, I wouldn’t mind help in this category. So, if you have something that you are willing to part with, and are willing to donate to me to giveaway or raffle to raise funds, let me know. As much as I would like everyone I know to come and take part, I get that we all have lives. I should also note, people who come to the event are not obligated to stay for the 24-hours. If you can only make it for a few minutes, that’s good enough for me. I appreciate the support. In case you didn’t know, you also don’t have to wait until the big event to donate. Here is a link to my Extra Life profile page. On the page you’ll see my goofy face and huge button that says, “Support Me.” Just click on the button, select the amount you wish to donate (which can be whatever you are comfortable with), enter some info, and that’s it. Simple! Oh, I forgot to mention. The big event is happening a the Battleground Games & Hobbies Abington store! We’re going to start at 12:00 AM and go until 12:00 AM the next day! So stick around after FNM if you’re there. That’s it for now. If you have a comment or anything then leave a message down below. If you want to contact me about the Extra Life charity or for all other inquiries you can also e-mail me at Sims@battlegroundgames.com. Donate to the Extra-Life fundraiser! Indie Boards and Cards has announced two planned expansions for its deduction card game The Resistance this November, according to ICv2.com. Hidden Agenda and Hostile Intent were funded through a combined Kickstarter program that attracted pledges over $100,000, featuring promos and incentives that will not be included in the final retail version. In addition, both expansions include a number of “modules” that can be added to the base game in any combination. 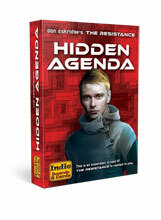 Hidden Agenda includes three modules. In “Assassin,” the roles from The Resistance: Avalon have been re-themed and renamed for the Resistance Universe. The “Defector” module introduces characters that can switch sides during the game. And “Trapper” adds a spy-catcher mechanic to the game. 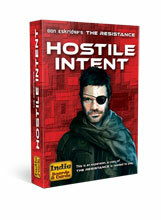 Hostile Intent also features three new modules. “Hunter” shifts the focus from targeting the enemy’s facilities to neutralizing their leaders. The “Reverser” can change the results of a mission, turning defeat into victory (or vice versa). “Inquisitor,” meanwhile, introduces an ability from The Resistance: Avalon that allows the Inquisitor player to examine the affiliations of other players. The Resistance was Indie Boards and Cards’ breakout hit in 2010. It was featured on Geek & Sundry’s TableTop web program, and is currently available in 20 languages. It is a deductive card game with similarities to the classic party game Mafia and plays in about 30 minutes. Abington, MA Grand Prix Boston-Worcester Trial – THIS Sunday! • 1st Place will receive a sealed booster box of Modern Masters. • Prizes beyond that will be based on attendance. Battleground is one of New England’s premier game stores with two convenient locations. We are fully stocked in all the major product lines for the serious gamer and we specialize in card games, board games, miniature games and role-playing games. Our deep stock, great events and friendly, knowledgeable staff make Battleground the top choice for your one-stop, friendly local game store! This past Friday, for FNM, I played a fun Mono Green deck. I guess you could say, it was a strict budget deck. I spent less than $20 on the cards that I needed, and less than $10 on cards I needed for the main board. This was also the first time I played the deck. That tends to be the case with a lot of decks I play. However, it makes things a lot more fun when you learn things on a whim. I should also mention that this deck was not my creation. This deck was found from the “Decks of the Week” section on DailyMTG.com. This deck was played by “ph_crescens,” and they went 4-0 with the deck. This deck was a lot of fun to play. I was able to win many game ones, but I ended up losing all my games after that. I lost my element of surprise and didn’t have enough reach. Still, losing helped me understand the deck more. With that, I now have a better idea as to what the deck needs. While I really wanted to stay on budget, this deck really needs Mutavaults. There was no worse feeling that right after a Supreme Verdict. Once that was cast, I had lost all advantage. If I were running Mutavaults, not only would I still have a threat on the board, the pump spells that remained in my hand would never have gone to waste. Wild Beastmaster is a really cool card. Well, it’s cool when you can actually trigger it with a pump spell. Otherwise, it is absolutely terrible and is the first thing I would replace. It was obviously respected by my opponents because every time I played it, it would die right away. So what could replace it? Boon Satyr would be a really great addition to this deck. It’s a 4/2 for three mana, and it’s cost helps add to the overall devotion because it has two green symbols in its cost. The added bestow ability is great for those times the deck begins to flood out. Not to mention, it helps in those situations where your opponent casts Supreme Verdict. 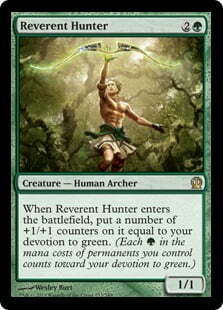 It also helps add to your devotion with the two green mana symbols in its casting cost. This will help boost our Reverent Hunter and some new additions to the sideboard which we’ll get to in a bit. He wasn’t in our original build, but Polukranos, World Eater would be excellent for this deck. He’s a little more than a budget card, but those rules went out the door when I found the need to add Mutavault. A 5/5 for four mana is hardly something that you can ignore, especially since it has the monstrous ability and helps add to your devotion. What green deck would be without Nylea , God of the Hunt? Because she is a Legendary Enchantment, and her becoming a creature is dependent on your current board state, she has to be limited to 2-3 copies. However, she should be a power house in this deck. Even if she doesn’t become a creature, she finally give your creatures the reach this deck has been needing which is trample. She can also pump your creatures to an absurd number. As you can see, I’ve decided to go all out with the devotion. By adding Voyaging Satyr and Nykthos, Shrine to Nyx, we’re aiming to get our big guys out there as fast as we can and hit them hard before they know what hit them. However, this deck will definitely have its vulnerabilities. For example, once your opponent has an idea as to what’s going on, then the right removal spell will set you back to the stone age. Mistcutter Hydra and Skylashers should help you against the control matchup or anything that has blue in it. Ranger’s Guile will help you against decks like Mono Black where removal spells are dominant. Mending touch is something to think about and is a neat little trick against board wipes like Supreme Verdict. However, it only helps one creature at a time, so be wary of its limitations. This should be a fun deck to run at an FNM. I’d be a little cautious before running it at the next major tournament. If you do decide to take it to something major, there are still some tweaks it can afford, but only some major play testing will help you figure that problem out. If you have any suggestions on what others could play in the deck, then let us know in the comment section below. I would love to hear what other people have to say. Ps. There is still plenty of time in May for you to help me hit that goal of $300 for my Extra-Life campaign! So donate today! One lucky person might win their own copy of Takenoko from me! Click on the banner below. Simeon is an avid gamer who loves to play board games and video games. He graduated college with a degree in Political Science, and now serves the public by writing about games. You can check that out here. Don’t forget to “like” him on Facebook as well. It’ll update you on all of his newest content. Best of all, you can follow Simeon on Twitter (@SimeonCortezano) for some real time hilarity. Thanks for reading!